Remembered as one of the most tragic victims of European imperialism, the Belgian Congo suffered decades of exploitation, violence, racism and repression. By restricting access to higher education and monopolizing political and military leadership positions, the Belgians maintained an iron hold over their resource-rich colony. 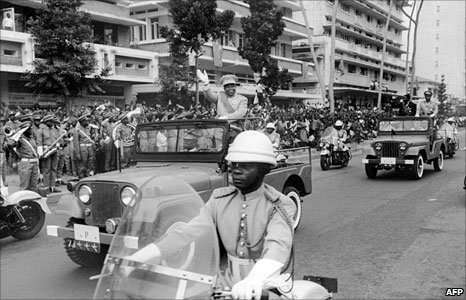 Then, after a wave of African independence movements and without ever investing in the country’s native populace or infrastructure, the Belgian government abruptly handed power over to a band of hastily elected Congolese officials on June 30, 1960. 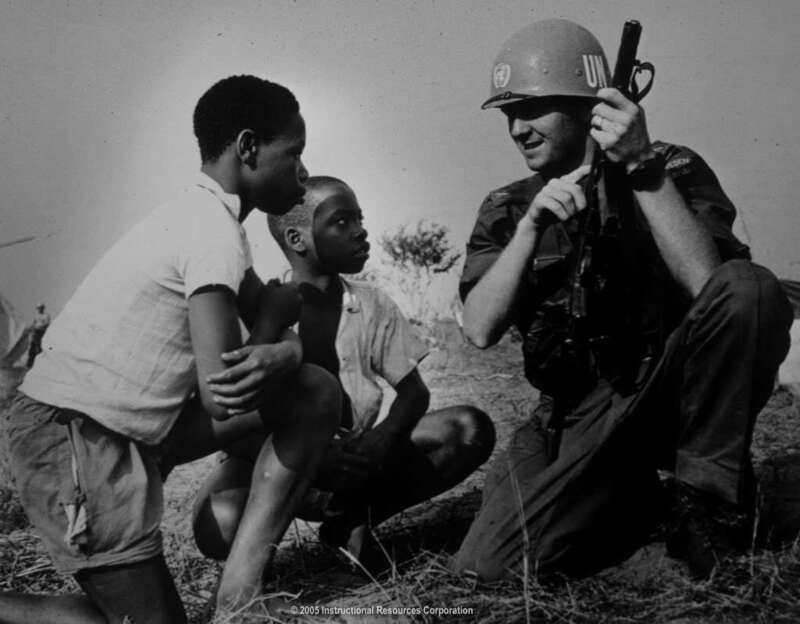 One week later, violence broke out within the Congolese peacekeeping gendarmerie, the Force Publique, and across the country as the Congolese targeted their Belgian, European and white neighbors in a spree of revenge killings. The ill-fated Le Pari Congolais, or Congolese bet, by which the Belgians abandoned the populace to the ambitions of unprepared and inexperienced leadership, prompted a flood of frantic evacuations and instigated five years of turmoil in what came to be known as the Congo Crisis. In the following interviews with Charles Stuart Kennedy beginning February 1991 and November 1989 respectively, Consular Officer Owen W. Roberts and Consul Alan W. Lukens discuss their impressions of the Belgian Congo, the achievement of independence, the violent repercussions of freedom and the hasty evacuation of the former Belgian masters. Read other accounts from the Congo Crisis. ROBERTS: So I went off to the Belgian Congo. It turned out that, sometimes, you can’t manage your own career as well as fate. The Belgian Congo became, diplomatically, quite a growth stock. While I was there, we went from five officers in a consulate general to the post-independence period of an embassy with about 35 people and at least 80 more in other agencies. The Congo developed into a major Washington concern, and it ultimately involved a 24,000-man United Nations peacekeeping force, even, from time to time, some direct Secretary-of-State attention and general White House interest. The Congo was strictly a Belgian colony. The U.S. Consulate General there, you might say, was a colony of our embassy in Brussels. As a CG [Consulate General], we were expected to do citizenship affairs, promote a little trade, travel, and live very much within the Belgian framework. All analysis and real reporting would be done by the embassy in Brussels. We had a consul general, an economic consul, myself, an administrative officer, and a secretary…a small post in a backwater with no expectations of any change. If we did a cable, it took several of us to put it on the one-time pad. Then usually, when we said anything, Embassy Brussels commented about five times more than we had. It cost us hours deciphering all the messages that Brussels sent reviewing our obstreperous remarks. This didn’t make much difference for the first year, because it was a very backward, controlled colony and nothing was yet happening of any great interest. But as independence got closer, there got to be more and more violence. Belgian control began slipping and the future got uncertain rapidly. The Congolese were really totally unprepared. I think that it’s generally acknowledged there were fifteen Congolese college graduates at that time, and maybe only one or two of them actually back in the Congo doing any kind of work in the civil service. 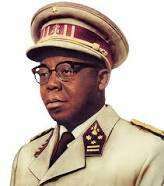 No Congolese in the military was higher than a sergeant-major. Nobody in private employment did more than run heavy equipment like bulldozers. Nobody was in any kind of private business outside the native areas. There was no one with any kind of organizational or managerial experience. There was the MNC political party (Mouvement National Congolais), but it was really put together by Belgians, largely academicians out at the Lovanium University, who were meeting with Congolese. 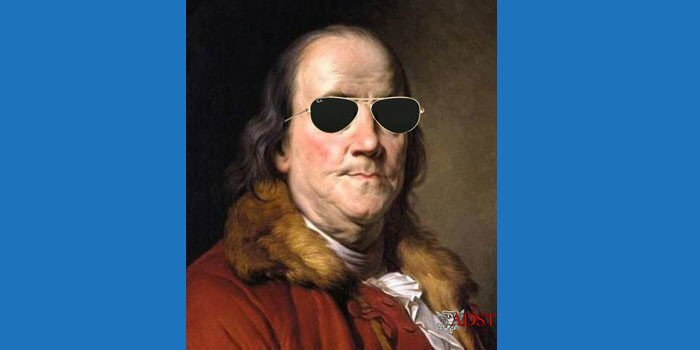 Once Belgium announced that they were going to grant independence and hold elections, we Americans started to make a few contacts. This had been and still was forbidden. I remember that our Consul General invited [Joseph] Kasavubu, who was then one of the leading candidates for local ward office in Leopoldville, and who later became the first President, in to see him. It was unimaginable that you would meet a Congolese in an office, so he was invited to the residence. The consul general’s cook arranged for Kasavubu to come in through the kitchen to meet the consul general. Q: Was this because of Belgian sensitivities? ROBERTS: Indeed. We had not been allowed to have any contact with any Congolese up to that time. This was Belgian policy, accepted by Embassy Brussels and Washington. In those six months before independence, I tried to branch out. Coming back on an airplane from a trip around the interior [of the Congo], I talked with a Congolese, who was being invited by the Administration to a meeting of chieftains who were going to become part of an honorary senate. I asked him to visit the office, but he said he didn’t think he could do that, but maybe I could meet him downtown. I did, and only learned much later that the Belgian government had asked that I be declared persona non grata. I don’t think even our consul general knew anything about it; this was done by a Belgian channel directly to Brussels, and it was sent then to the Department. The Department handled it, and I never learned anything more about it than that it had happened. It was a completely U.S. hands-off situation. But then when violence and rioting started, it escalated rapidly and on quite a large scale. Things got more and more tense, just the way the front lines that I knew in World War II had been. You drove your car very carefully; you looked around corners, because there might be logs in the road. You watched people on the edge of the road closely, because they would suddenly scoop up a rock and heave it at you. Any white person was an enemy. It was one of my first frustrations, learning that when there’s a class war situation, it doesn’t make any difference if you’re a good American or a bad Belgian. As whites you’re all in the same boat. It was a difficult situation. On one of those occasions, I tried to skirt along the African sections of town where there had been about 85 people killed to follow up on what was happening. I came across a manned roadblock; some Congolese jumped out from the roadside bushes and began beating on the car with clubs and big iron rods. I only just got out of there—the windows were broken and they were jamming the rods through the windows—by driving through the bamboo compounds, and rejoined the road at a later point. It was a dangerous, difficult period. 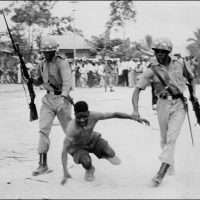 In a matter of two years, the Congo went from an absolute calm, controlled, Belgian atmosphere—you could have been in Brussels, for all you knew, except for the palm trees and heat—to where you were in a primal, savage situation and could be killed anywhere outside the all-white areas…. LUKENS: Then, of course, the big event of the year, later, was the independence of Belgian Congo. And, true enough, about one week later the “Force Publique” rose in mutiny and threw out the Belgian officers and non-coms. That’s the beginning of that whole scenario….People knew that the old regime and system wouldn’t last too long, but I don’t think we were all that prepared, and certainly Washington was not. So my first word of impending disaster came on the walkie-talkie that I had with the DCM [Deputy Chief of Mission] in Leopoldville, Bob McIlvaine. The walkie-talkie was on my porch. Our Consulate was an old Belgian bank and the top floor was the Consul’s residence; there was a big balcony and we could only use the walkie-talkie across the river because the phone didn’t always work—it didn’t work at all in fact. So at 5:00 in the morning I got a call from the Embassy that all hell had broken loose, and the Force Publique had broken out in mutiny, and that the whites basically, including Americans, were all commandeering ferries and coming across to Brazzaville. So I got dressed and ran down to what was called “Le Beach,” where the ferry came in, and waited for it. There weren’t all that many Americans who got off at the very beginning, perhaps 30 or 40, including dependents from the Embassy. We moved the official dependents right into our house at the Consulate; the others we housed with the French. The French weren’t being very helpful at that point but they finally had to because they got a lot of pressure from Brussels. Most of the people were Belgian. And they turned a couple of schools over to take care of the people, and so on. Then, as the situation got worse, the search for Americans moved out to the bush, and finally there were Americans discovered all over the place, especially missionaries, some of whom had been there for years. They’d gotten lost; nobody knew who they were. But there was a fairly good missionary radio network. So what we finally did was to set up a command post at the Consulate with the radios tied in with the missionaries. And meantime the Air Force had sent down a couple of helicopters and several other planes, so it was the only time in my life I could say I commanded an air force. We organized missions every day through this network out into the bush in the Belgian Congo to bring back these missionaries. Then there was a big question about how to get them out of Brazzaville, and whether they should be evacuated, or what. So finally, after a lot of argument, the Department chartered a couple of Pan Am [Pan America World Airways] planes and took the evacuees to Ghana. And then larger planes came in, finally, but they were mostly filled with Belgians, and all kinds of other people were loaded on them to get back to Europe. It was a very, very wild time …. But, finally, the Embassy went back to the Congolese and got them to agree to request a UN force. At that point there was another breakdown. I think they must have had some communication, but they didn’t at that time because I got the call again from the walkie-talkie saying, “Tell the Department to ask for the UN. We’ve got the okay from the Congolese.” After some tries I managed to get a long distance phone call through, but I got a Mr. Olson in Minnesota first. I’ve never figured that one out. I don’t know how the hell that happened, but finally I got through to Washington and passed the request and that started the whole ball rolling for the UN support. So the whole business of evacuating people, and getting them out of Brazzaville was complicated. I had terrible fights with the French about getting permits for these American planes to come in. One of the big planes carrying the helicopters was only about 100 miles away and they said they [the French] wouldn’t let them land. Well, he backed down. The planes were practically there. I think this all came so fast that it wasn’t cleared from Paris….There was such a panic, and there were so many people, and they were bringing in the helicopters; we had to get some people out of the bush. I don’t think our boys worried about clearances because they figured that NATO planes could go anywhere in the NATO area…. Q: How did you feel, there, about what was happening in the Belgian Congo? LUKENS: There was no question at that point of unrest in the French areas. You have to go back a little bit and remember that in ’58 they [the French] had set up local parliaments so they had a Prime Minister–they didn’t have much power in each place; and a Cabinet, a National Assembly, and all of that. And each Minister had a Frenchman sitting behind him. And you had the French troops, and you had the High Commissioner–the Governor General. So there were certain trappings of independence in place. And the French Africans were very, very disdainful of what had happened in the Belgian Congo. The Belgians were stupid; they didn’t train people. The Congolese (Zairois) were particularly nasty to the Flemish because almost all the Belgian civil servants, and all of the military, were Flemish. There were only a handful of Walloons, the Francophones. So you had the disdain about the way the Belgians had not prepared their people, and then you also had—which still goes on—a snobbism that the French Africans were much better educated than the Belgian Africans, and that’s still true. They feel very superior, even though they are very much fewer in numbers nowadays….